Tyrone Priestman has recently completed the GQA Level 4 Award in Internal Quality Assurance of Assessment Processes and Practices which will enable him to carry out internal quality assurance of GQA qualifications. Ty’s working background is in Automotive Glazing and Training and Development, starting work for IVS Training and Assessment in 2011 as their Automotive Glazing Assessor. This was a new area for IVS who have been a pro-active GQA Approved Centre since 2005, providing Glass and Construction Training for both individuals and companies. Ty said “The qualification was the natural progression route for me to take as it allows me to broaden my skill set, the process made me see things that maybe I previously wouldn’t have, indirectly making me a better assessor. Seeing the process from the aspect of the IV makes you look at how you can improve as an assessor, and to ensure consistency and quality is achieved. The qualification itself was very structured and detailed and more importantly, relevant. To have achieved the qualification means that in an ever demanding workplace I have made myself able to take on more involved tasks and be able to assist the guys at IVS to a greater extent than before. Not forgetting that in addition it has improved my personal career opportunities and is valuable CPD”. 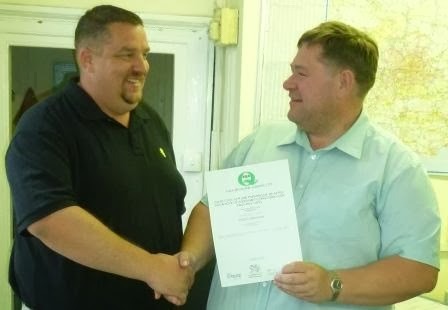 Ty (left) is seen below receiving his certificate from GQA EV, Phil Douglas.